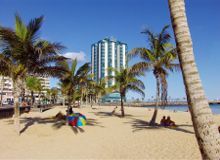 This five star hotel stands majestically next to the sea over the beach "El Reducto". It is rounded by a wide park and opens the city to the sea. Its style is modern where function, comfort and refinement give us luxury and relaxation.